Managing my own social media profiles online is hard enough, so taking on a few more accounts may not initially seem like the best of ideas. For the next few weeks, I will be running the social media profiles for interhacktives.com, a website operated by City’s Interactive Journalism MA students, the Twitter and Facebook accounts for ‘From Student to Startup’, a website for students interested in starting their own business, as well as – for just one week sometime in November – the social media presence of the Hackney Post. Oh yeah, and my personal accounts. Chaos, you may think. Well probably. However, here is my rather basic plan on how I will try and avoid it. After having a test run on the Hackney Post social media accounts last month, I made a few notes and suggestions on how to do it once things did eventually get a little more serious. Yes, you do need them. Using twitter.com via a web browser is not particularly suited to twitter “power users” who want to monitor customised twitter lists, hashtags and more in one place and not having to switch constantly between tabs or windows, but becomes almost impossible when having to switch between a number of accounts. Managing social media profiles will end up taking most of your waking day if you do not organise and streamline it via some type of social media management application. TweetDeck (excellent if you have to run a number of twitter accounts) and Hootsuite (where you can manage a range of social networks and ideal for brand management in particular) are the two most popular social media dashboards. I will not wade into the Tweetdeck vs Hootsuite debate, a lot has been said about this already, some analysis here and here – and I have precious little to add. 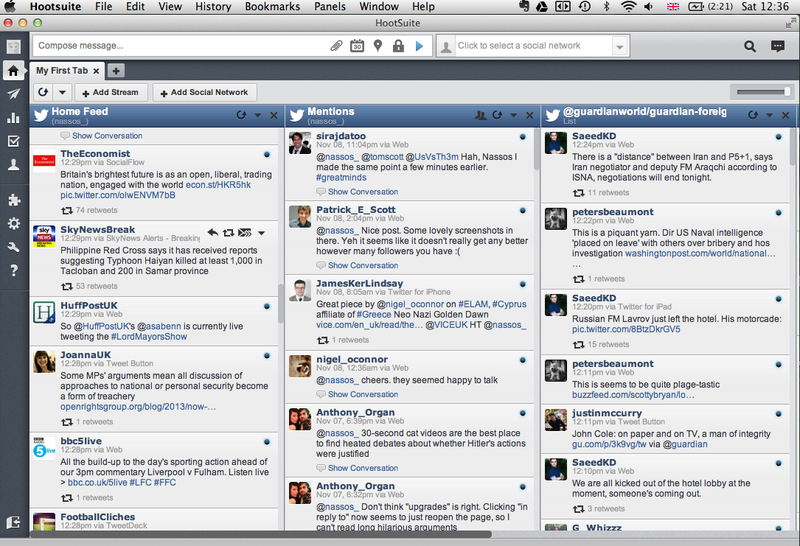 I am a big fan of Tweetdeck, which I have used for some time, and just starting out on Hootsuite but just one tip. If you are using a Mac and prefer Tweetdeck because it is a desktop based application instead of Hootsuite’s browser based interface, you can make a Hootsuite application by following these very simple instructions. One major thing to always look out for every single time you post something, whether Tweetdeck or Hootsuite, is the account you are posting from. As social media editors from established media organisations will testify, it is pretty much the easiest mistake to make – and not just in the media. This is what happened to automotive industry giant Chrysler a couple of years ago. “act like your mother is watching you. Assume that whatever you post will be seen by everyone. Then, if you do make a minor mistake (e.g. posting to the wrong account) the damage is minimal”. This is really useful if you have a number of different gmail accounts linked to the different social media accounts you are running. 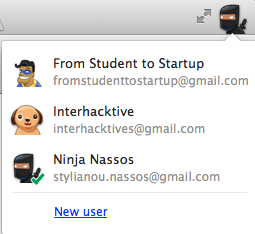 If you are using Chrome, and for this I recommend you do, add new user accounts for each of your different profiles. It’s pretty straightforward, here are some simple instructions. By having different Chrome accounts, you can have different browser extensions (such as bitly, delicious, storify, gmail) linked to each account, meaning your life becomes much easier by just switching chrome account. You can also log in to each account on whatever computers and have access to your account bookmarks, history and extensions, wherever you are. A little forward planning goes a long way. If circumstances allow for it, schedule tweets and Facebook posts in advance. Unless you are dealing with time-sensitive information, you can prepare content to go up on social media accounts at different times of the day, ensuring that your content will reach a variety of audiences, instead of a barrage of tweets or posts within the short time-frame, which could miss some people altogether. 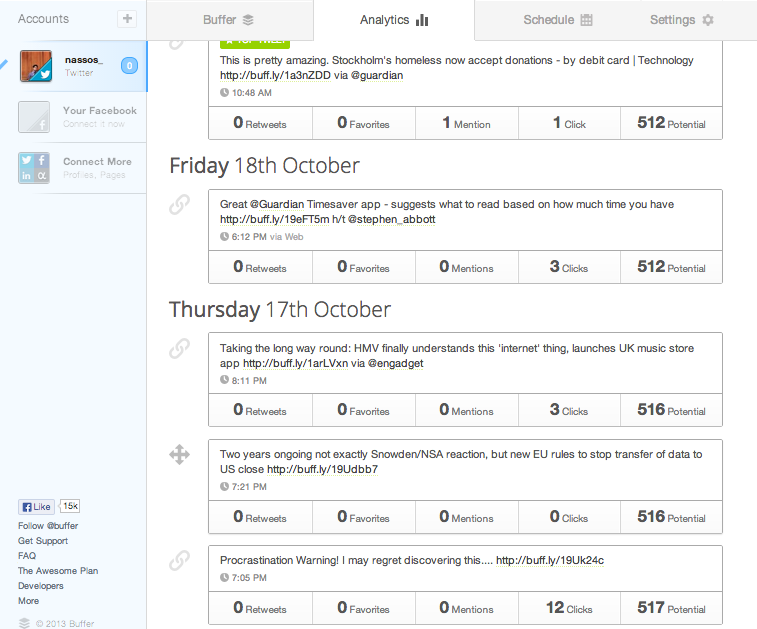 Both Tweetdeck and Hootsuite offer the possibility to schedule posts. What I tried out for the Hackney Post (with a mishap along the way) is to schedule tweets even for just a couple of minutes after instead of posting directly. This is just so you can double-check the link is working before it goes live. It’s very easy to get sucked into the social media world and actually forget why you are actually there. Make sure you keep your audience in mind whenever you post online. Don’t monitor reactions and interactions online for the sake of vanity, but let others on the team – and in particular the individual writers – know what has been said about their article and the sort of traction it got on social media. They will thank you for it. In the next week or so, those of us on Interactive Journalism MA at City University will be given access to run our own group website, #Interhacktives. This is a requirement for one of our course modules, Social Media and Community Engagement, however it is also a great opportunity to critically engage with digital journalism, analysing and writing about all things social media, community engagement and data driven journalism. The question we have been asked to address before beginning our #interhacktive journey is to identify our audience. How would we describe a ‘typical interhacktive’? Without having access to any website analytics or metrics about our users that either a subscription or a detailed advertising model can provide us, this is not an easy task. I may be slightly cheating with this approach, but I’ll take the risk. I think that potentially there does not have to be just the one archetypal interhacktive reader, but there could be two different types. The one is an aspiring digital journalist much like us, with an insatiable appetite for as many how-tos, listicles, previews and tutorials of any new interactive tools and general insights into the world of digital journalism as we can provide him with. This type of interhacktive reader knows his Feedly from his Net Vibes – in fact he is probably writing a post on his blog about which is better to use. He has trouble seeing his URL bar on Chrome from all the browser extensions and add-ons he is experimenting with. He’s just calmed down after a long rant on how his mobile phone network carrier is STILL not compatible with IFTTT and he has to check weather for the day via his iphone weather app instead of receiving the daily forecast as an SMS just before he gets out of bed in the morning. Interhacktives.com will certainly be on his RSS feed and he may even have the hashtag running on his Tweetdeck (other third party apps are available), looking to get the latest insights into all things interactive journalism, staying very much on top of the game. The second type of interhacktive reader is a technology-fearing journalist who swears under his breath every time he hears someone utter the phrase “digital revolution”. He spends a considerable amount of time cursing Sir Tim Berners Lee for inventing the Internet, despite actually using it for almost everything he does. He calls Twitter “that Twitter” and thinks that Tweetdeck and Hootsuite are things you are likely to come across on sale at an RSPB-approved garden centre instead of the App store. Do you know your Tweetdeck from your Hootsuite? However, this reader is looking to get to grips with the new realities that the internet has brought about as publications are moving to a digital-first strategy with more online-only media organisations popping up. Deep down he does know that being “rubbish at technology” will no longer cut it and that his best option is to embrace his digital future, so is on the lookout to improve his technical abilities. Interhacktives can be a good starting point for him to do so. Our challenge is to first and foremost to attract more of either type of reader and to make sure we have enough varied content to keep both happy. Data within newsrooms is only partly about using statistics to find stories and presenting them in a visual and engaging way. Data analysing the reach, popularity, type of engagement and how people found a particular piece of content are paramount for not only news organisations – but for companies, brands or individuals to evaluate their online presence and its effectiveness. From WordPress analytics available to those running a blog or website on that platform, to Google Analytics, Chartbeat, Facebook insights and tools looking at twitter engagement such as Hootsuite, bit.ly and Buffer, there is no shortage of options. 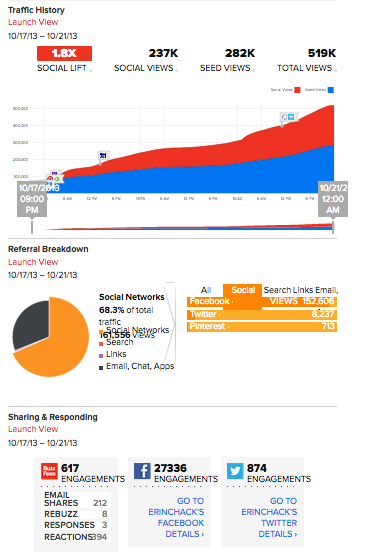 What these tools do is provide an insight into how others came across your content and how they engage with it. As you can imagine, this is essential to all media organisations – what is the point of producing content if, for whatever reason, people can either not find it, or don’t want to see it? The assumption that analytics and measuring user engagement is a thing for “geeks”, or those with excessive amount of vanity, no longer holds true. Finding tangible ways to evaluate one’s output is the best way of working to improve it, both for yourself and your audience. With digital journalism and specifically the rise of social media analytics (interesting infographic on that here) journalists can have instant access to in-depth analysis of how well their own article is doing online and what sort of reach it is getting. 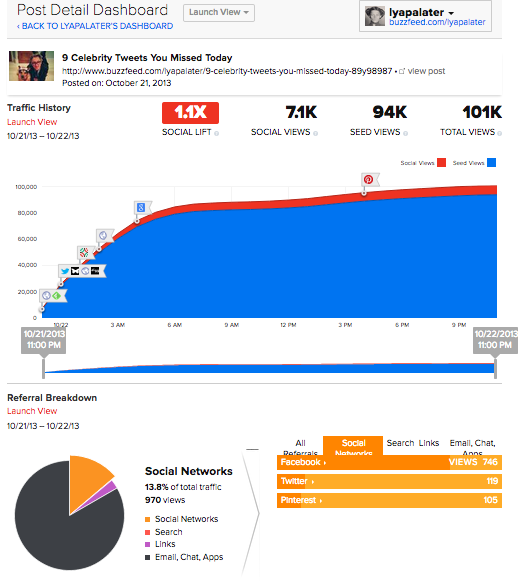 An example is the public viral dashboard that Buzzfeed US has for its articles. These two examples are very interesting in themselves, as they show very different patterns when it comes to origin of views, ie. where the readers came from. The first one large percentage of links originating from social networks, with the second one has considerably fewer ‘social shares’. Suffice to say that the one with five times the number of views was the one which was predominantly shared through social media. So, on a very (and I do mean very) micro level, I thought I would try this for myself, using my own personal twitter account. I have used Google analytics in a previous job, producing weekly analytics reports for a website, but under very different circumstances and with considerable restrictions, however I have never really thought about how and what I share online via social media, take Twitter for example. Last week, in a bid to for a more strategic online presence and intelligently experimenting with as many different social network tools as possible – I began evaluating my activity and what I can only describe as scattergun sharing techniques on Twitter. Posting and scheduling links via bit.ly and buffer have given me some interesting results. As I mentioned, this was done at a very micro level and drawing real conclusions from this is probably ill-judged. However, I have – for now – made one observation. First of all, one of the most depressing (but not completely unexpected) things I realised was how few people interacted with the links that accompanied my tweets – for which interaction can be measured. This may be somewhat normal, or it may be (probably is) due to poor strategy on my part, anyway it is worth some analysis. Most of the links attached to my tweets got 0-3 clicks – from a base potential of around 500. The potential did remain at a constant value, as none of the tweets I looked at were shared or retweeted. There are so many parameters when it comes to analysing this figure – people on/offline, time of tweets, type of followers I have, the content of the tweet, tone etc etc (I could really go on and on here). I will analyse this further as I continue this strategic process but overall, my first and very basic impression is that within social media, you (or at least I) need to think and work hard to get people to click and engage with the content you are sharing with them. This is even when these people have some sort of interest in what you are tweeting, as they would presumably not be following you otherwise. Interestingly, the tweet that did (marginally) better from this tiny sample was a more cryptic, ‘mysterious’ tweet linking to a beta full screen online version of Super Mario – without explicitly mentioning it and warning my followers not to click because of the potential of procrastination. In fact, maybe that’s the answer and I’ve cracked this. Telling people not to click. That’s guaranteed to get them interested.